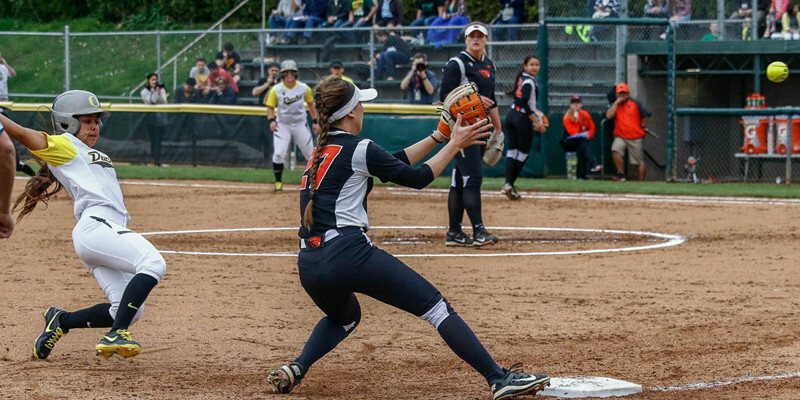 Before the game with the Beavers, Oregon Coach Mike White told his star pitcher Cheridan Hawkins to “be aggressive.” White is a wise man; he knows that aggressive teams win ballgames. Hawkins followed White’s instructions throwing a no-hitter while blanking Oregon State 10-0 in a run-rule shortened game. 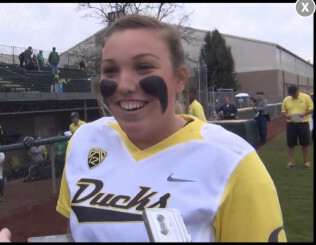 The no-no was Hawkins’ fourth at Oregon, making her one of the best players to wear the uniform. Aggressiveness was the word of the day for the Ducks. In the second inning, the bases were loaded when Janie Takada cleared them with a triple to the left centerfield fence, putting the Ducks ahead 4-0. Janelle Linvall must have been eavesdropping when White talked to Hawkins about aggressiveness. Later in the inning, she knocked in two runs with a blooper single off the pitcher’s glove. In the fourth, she laid down a perfect bunt down the right foul line. Meant to be a sacrifice, she beat out the throw to first and earning another RBI. Aggressive play means creating your own breaks. Cheridan Hawkins talks about being agressive. If you haven’t watched women’s softball, check out a game in person. You’ll be in for a treat. This isn’t a bunch of middle-aged dudes playing slow-pitch ball with brews on the line for a victory. The Ducks are talented, aggressive and opportunistic. Their game is fast and entertaining and the Beavers never had a chance in this one. Essentially the game was over in the bottom of the second when Oregon scored six runs. By then Hawkins had cowed the Beavs into submission. The visitors played passive ball, no match for the joyous Ducks. As Hawkins put it after the game, her team was happy to be home, happy to be playing in front of appreciative fans and happy to be playing the Beavers. Winning does that for a team, creating chemistry and a passion for winning. The Ducks possess that combination, a combination for success. Over the next eight weeks, the Ducks will not only need to be aggressive, they’ll need to be consistent; carry that edge and that energy with them throughout the conference season right up to a possible trip to Oklahoma City and the College World Series. That road continues Saturday with another game against Oregon State at 2 p.m. at Howe Field. If you have a chance, catch the Ducks in action. You’ll see some great ball.